Ace Hardware Corporation, the largest retailer-owned hardware cooperative in the world, is pleased to announce the roll out of “Buy Online, Deliver from Store” at participating locations across the country. The new delivery option is a key feature of the enhanced e-commerce site, AceHardware.com. Ace locations participating in “Buy Online, Deliver from Store” offer same day, next day and standard delivery options with purchases delivered by a local store. Ace Reward members can receive next day and standard delivery for free on in-stock orders totaling $50 or more. Each independently owned and operated store determines its own delivery radius and delivery pricing. In addition to delivery, Acehardware.com has several other features to optimize customers’ online shopping experience including in-store pick-up and product assembly at participating retailers. Customers have access to an average of 25,000 products in-store and thousands more online. 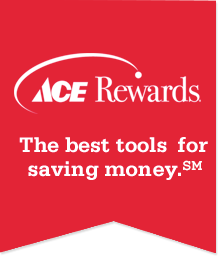 Ace Rewards members can earn and redeem points online and receive instant online savings. Customers can also check product availability as well as services offered at participating local Ace stores. For more information on “Buy Online, Deliver from Store,” visit www.acehardware.com/we-deliver.